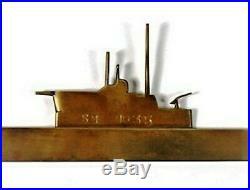 A Rare WW1 German Trench Art Brass Silhouette of U-Boat SM U-35. The Most Infamous U-Boat Of World War One. A very rare World War One German trench art made from a brass sheet cut accurately to form an accurate silhouette of the Imperial German U Boat submarine SM U-35. It is such an usual piece of art, approx. 38cms (15ins) long, as it represents one of the most infamous German U-Boats in WW1, making this a rare item as well. Class U-boat which operated in the Mediterranean Sea during World War I. It ended up being the most successful U-boat participating in the War, sinking 224 ships for a total of 539,741 gross register tons (GRT). Her longest serving captain was Lothar von Arnauld de la Perière, & under his command. Sank 195 ships, making him the most successful submarine commander in history. But this is just metal, behind these sinkings was a massive loss of life that was in the low thousands. Key Facts About U-35. Surrendered 26 November 1918. Broken up at Blyth in 1919. One of the interesting facts for me is that I live in Blyth where 100 years ago this year U-35 was broken up at the docks I know so well, only a walking distance away. So the asking price is a real reflection of its’ value, as this will increase in value over time. This lovely item that has a fascinating history, it links you directly with named people in The Great War, representing a new form of warfare that was horrendously & regretfully successful. There arent very many pictures as its hard to take pictures of a flat surface, but the salient details are all there and it is a piece of antique history. The item “A Very Rare World War 1 German Trench Art Brass Silhouette of U-Boat SM U-35″ is in sale since Saturday, April 6, 2019. This item is in the category “Collectables\Militaria\World War I (1914-1918)\Trench Art”. 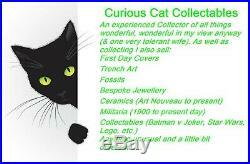 The seller is “curiouscatcollectables” and is located in Blyth. This item can be shipped to United Kingdom, Antigua and barbuda, Austria, Belgium, Bulgaria, Croatia, Cyprus, Czech republic, Denmark, Estonia, Finland, France, Germany, Greece, Hungary, Ireland, Italy, Latvia, Lithuania, Luxembourg, Malta, Netherlands, Poland, Portugal, Romania, Slovakia, Slovenia, Spain, Sweden, Australia, United States, Canada, Japan, New Zealand, China, Israel, Hong Kong, Norway, Indonesia, Malaysia, Mexico, Singapore, South Korea, Switzerland, Taiwan, Thailand, Bangladesh, Belize, Bermuda, Bolivia, Barbados, Brunei darussalam, Cayman islands, Dominica, Egypt, Guernsey, Gibraltar, Guadeloupe, Grenada, French guiana, Iceland, Jersey, Jordan, Cambodia, Saint kitts and nevis, Saint lucia, Liechtenstein, Sri lanka, Macao, Monaco, Maldives, Montserrat, Martinique, Nicaragua, Oman, Pakistan, Paraguay, Reunion, Turks and caicos islands, Aruba, Saudi arabia, South africa, United arab emirates, Ukraine, Chile.